Trajan’s Column, as a historical document. Caesar – The Man of the People. Ancient Stories – The History of Intimate Clothing. The main written works dedicated to the Dacian-Roman wars have had the trouble of not keeping up to this day. Emperor Trajan himself wrote a book about the Dacians wars (De bello dacico) illustrating the stages and triumph of the Romans in these long-lasting wars. Criton, a companion in Emperor Trajan’s campaigns, wrote a book called “Getica,” which was lost. Dion Chrysostomos, a good acquaintance of the realities of Dacia, wrote a book called “Getica” that was lost. The books on the Dacian wars of Appian, Arrian, Ammianus Marcellinus and the Daco-Roman War Dialectics chapter are missing. Florus’s poem dedicated to the victories of Emperor Trajan is also lost. Suetonius concludes his work with Domitian, not to write about the reign of Trajan, and Historia Augusta, the chronicle of the Roman emperors begins with the reign of Hadrian. For these reasons, The Column is the main historical source for the reconstruction of scenes, stages and events that have gone through the wars. Column, before being a historical monument, is also a work of art, being a source of inspiration for artists and ethnographers to reconstruct portraits, clothing and weapons. At the same time, the topographic and architectural importance of the areas and fortifications can give us clues about the course of struggles between the two camps. Also on the high spiral image of the two wars waged by Trajan, polychrome images, depicting 123 episodes and 2500 characters, Emperor Trajan’s image is reminiscent of 60 times, and the image of his worthy adversary, Decebalus, of some 8 times. 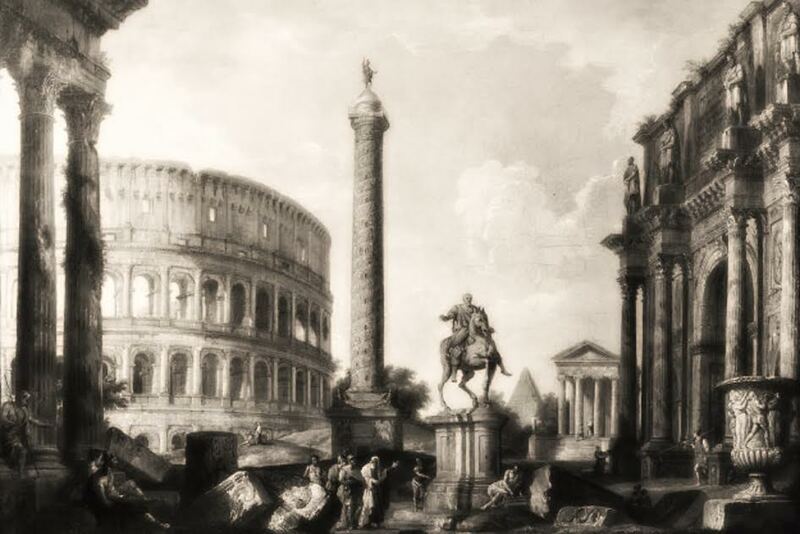 The Column was also a model for the construction of Marcus Aurelius and Aurelianus’s Column, but also for the works of plastic artists such as Michelangelo or Rafael. After the end of the Dacian wars, Emperor Trajan returned to Rome with an immense amount of gold and silver (165,000 kg of gold and 331,000 kg of silver), celebrating 123 days in Rome, during which more than 10,000 gladiators fought. Taxpayers were exempted from paying the tax for 1 year, and many edifices were to be built. Trajan’s forum, in honor of the victories against the Dacians, was inaugurated in 112, the triumphal arc raised by the Senate and destroyed during the reign of Constantine the Great, the famous atrium of the square surrounded by columns, the center of Traian’s equestrian statue, the Basilica of Ulpia , The Column, the Ulpia library divided into two buildings for Latin and Greek literature and Trajan’s Temple. Trajan’s Column, erected on May 12, 113, is the only monument that has been preserved from the Trajan’s House. Being the largest relief sculpture in all Antiquity, the Columna consists of four parts: the foundation (where was a room for receiving Trajan’s ashes), the pedestal, the column (the column itself) and the statue of Emperor Trajan. In 1587 Pope Sixtus V replaced the Emperor Trajan’s statue in which he was represented in the military uniform and holding a lance with the statue of Saint Peter. Three sovereigns of France have expressed their desire to have a reproduction of Trajan’s Column, a desire expressed by King Francis I, Louis XIV and Napoleon III. The latter endowed France with a complete reproduction of the Column, and another full copy of the columna is in England at the Victoria Museum, at the initiative of Queen Victoria. Jérméme Muzino copied and published Trajan’s Column in 130 screens, and Petro Sânti Bartoli, the antiquity of Pope and Queen Christina of Sweden, retouched Muzino’s drawing but did not achieve a copy perfection because he did not return the movements of the spiral, and the characters are rendered in a horizontal line. A profound analysis to correct Muzino’s work was made by Raphael Fabretti in his work – Syntagma on Trajan’s Column. The Column has gone through the centuries through various cheerfulness, but has managed to maintain itself in front of the invaders. The monument was robbed by Visigoths, who raped the tomb where Emperor Trajan was resting his ashes in a golden bowl. In the tenth century the municipality of Rome banned the deterioration of spirals and scenes threatening the death penalty, and the two 16th-century popes, Paolo III Farnese and Sixtus V, made the restorations and they removed the rubble that covered the base of the columna. Numerous specialists have expressed their views on the historical and documentary value of The Column. For some reliefs, it is a rather accurate sculpture chronicle with Trajan’s work (C.Cichorius, GTDavies, Carl Patsch) while for others The Column is an artistic propaganda monument with inevitable exaggerations and deformations in the report with the text of Dio Cassius. Among the supporters of the two variants are Lehmann-Hartleben E. Strong and R. Paribeni. In all these opinions on the historical documentary value of Trajan’s Column, the official character of the Court of this important monument, which somehow fulfilled the role of a political act of propaganda for the Roman Empire and Emperor Trajan, should be added. This did not allow artists to follow exclusively their own inspiration and initiative in the creative artistic sense, and therefore the designers and sculptors could not go too far from Trajan’s text. In support of this theory, there’s the realism of the Roman sculptors who had a special ability to describe the portrait of the characters and the bloody events on the battlefield in a relatively brief and schematic style. Despite some small contradictions between the written sources about the military campaigns of the Romans at north of the Danube in the two wars and bas-reliefs on Columna, the ancient film on the Column seems to be in line with the reality and most of Dio’s text Cassius. At the same time, this mission was entrusted to the famous Syrian architect, Apolodor of Damascus, who oversaw the good work of the works. Based on the knowledge of the realities of Dacia, Apolodor led the works commissioned by the Emperor, works that were at the peak of the Roman sculpture flourishing in the Roman Empire. Trajan was seen by all historians as one of the best emperors, so authority in his day could not be discussed. Undoubtedly, those who made The Column in Rome had not been in Dacia, but they talked to people who fought in the war. Thus the sculptors could not depart from Trajan’s text, because The Column has an official character, being raised between the two libraries and placed in the Trajan’s Forum. During the scenes, natural events occur in the displacement and unfolding of a war, namely Emperor Trajan’s speeches in front of the army, war councils, castles, battles, passing the Danube through a ship’s bridge, and a detailed description of the place, port, physiognomy and fortifications. Instead, if the monument were merely a propaganda artistic work, why the proud architect Apolodor of Damascus, who was assigned the bridge construction, did not show a laborious description of the bridge on the Column in a manner in which to impress citizens of the empire? Even though his work is one of the largest and most impressive edifices built in antiquity, the Romans kept dead to succinctly represent and synthesize the events and wars that took place during the wars. Another argument arguing that the monument is merely an artistic and not propagandistic work is the XLV scene in which the Romans are surprised by a non-specific drama of the Roman Empire. The dramatic scene captures the torture the Romans were subjected to by the Dacian women, the torture depicted by the burning of the Roman soldiers. Reliefs of the Column are truly a hymn dedicated to the bravery of the Roman army, the iron discipline that drives it, the mercy of the soldier in the Roman legions or the auxiliary troops. Nothing theatrically in these images, on the contrary, a restraint and seriousness that make Trajan’s legionaries true citizens, but dressed with the soldier’s plate. At the same time, The Column’s images are crossed by an indisputable respect for the defeated Dacians in an unequal battle. The dignity of the figures of Decebalus and the Dacian princes, the obstinate resistance that most Dacians oppose to the Roman weapons are, on The Column, the testimony of respect and humanism that ennobles the creation of artists. No other people of the many conquered and absorbed by the Roman Empire can boast of the fact that they have seen a more dignified and more durable monument of their desire for independence. Great compilation my friend. – As come to be expected from yourself, thanks for the share. Pleasure as usual my friend. The Roman Empire really held a huge significance in ancient history. Good work Man. Nice one from the history man! Trajan’s column is like a cinema blockbuster, before film came along. Enjoyed the post, my friend. I always wandered how all this pieces of art were created. How much work, people I guess even money behind. Beautiful monument! Cool post and very useful my brother. Thank you for sharing!